By the time Humberto Valle graduated with his first bachelor’s degree, he briefly ran a warehouse and held project-management roles, among other gigs. So when Valle lost his job at a Tempe engineering company a couple years ago because of the economic downturn, he was frustrated waiting one year to get back into the workforce. 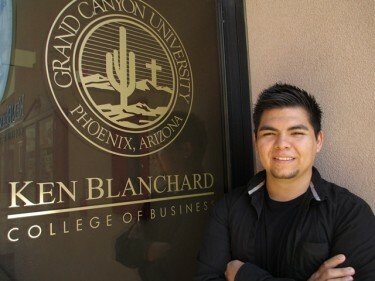 Humberto Valle discovered the inspiration for OppenUp, an online job-search company he founded, while studying at GCU. The experience of being unemployed led Valle to found OppenUp, a Web-based company he hopes will provide resources to help job seekers get in front of hiring managers. OppenUp blends multimedia with digital mapping of job opportunities to streamline the hiring process for both prospective employer and employee. OppenUp.com is scheduled to relaunch this spring, coinciding with Valle’s graduation from the Ken Blanchard College of Business at Grand Canyon University. “Being part of the GCU family has meant a lot, just as far as being able to talk to people there,” said Valle, a Texas native who graduated from high school at 15. He briefly attended an art school in Florida before getting into mechanical engineering and later into business development. “You not only get to meet other students, but you learn about … what led them to those (business) ideas,” Valle said. Valle, 25, holds a mechanical engineering degree from his hometown University of Texas at El Paso. He is graduating from GCU with a bachelor’s in entrepreneurship. Valle made connections on campus that led to a little start-up cash. With a bit more funding, Valle expects OppenUp to have a stronger Web presence and more complete package to present to universities in Arizona, California and Texas. The idea, according to OppenUp’s executive summary, is to “create a more standardized, user-friendly job search platform that incorporates social interactions and video applications” as a primary source for hiring managers to prescreen potential employees. Valle said OppenUp aims to cut through the formalized, document-heavy process that costs up to $750 per candidate through major online job search sites. OppenUp has value with its combination of video interviews, resumés and candidate bios, he said. Recruiters and hiring managers are able to pre-screen candidates faster, while job hunters can use the site to search for opportunities that once took him a year to navigate. “People need a fast way to apply to jobs rather than going through multiple different resumés or processes, and they also need a way to stand out without going crazy,” Valle said. Valle is a member of the Chandler Rotary Club and Chandler Gangplank, a business development collaborative workspace where entrepreneurs share ideas. He also runs a separate project, LaunchPadAZ.org, which focuses on helping small businesses with digital branding. He lives with his wife, Diana, and 3-year-old son, Santiago, in Tolleson but rents a place in Chandler to be closer to the think-tanks where he spends so much time. Scott Taylor, incoming president of Chandler Rotary, said Valle has provided invaluable pro-bono help with social media and website redesign. Taylor described Valle as a budding entrepreneur who is constantly networking, but who also takes time out of his own busy schedule to help with Chandler Rotary community outreach events.